And suddenly it was May! How does this happen? I mean, one minute we are coming back from Christmas Break and then it's March, and you blink and it's May! Seriously, the last thing you need is a project, right? Well, what if I have an engaging activity that will keep your kids busy AND it requires minimal prep from you? Hmmm...sounds good! What exactly is that? To me, it means printing and making some copies and being able to hand that right to the kids. That does not sound much like setting up an Escape Room activity, does it? But, I promise this one can be set up quickly and easily. This one is different from the other Escape Rooms I have created. I have included a list at the end for the things you have to copy and prepare! HOW can it be done easily? Ok, first of all, I use locked boxes with my Escape Rooms- because kids love them. But, YOU don't have to! You can have kids solve the puzzles and fill in a 'paper lock code', present that code to you, and they receive the next task. You do not have to purchase boxes or locks. Instructions for this are included in the resource! If you do not use a locked box, then you do not need to print the box labels, so that is one less thing to copy, laminate, and cut out! Okay, let's be honest! Is there really a room involved? No! I actually have attended a "Break Out/Escape Room" event. They actually lock you in a room and you have to find all the clues to open doors and eventually open the door to get out. It was quite fun. But for elementary kids, let's not lock them in a real room! My Escape Rooms are puzzles, riddles, tasks, and solving problems to open locked boxes. The kids work together to solve all the tasks and open the locks to "escape". We call these Escape Quests! This one was actually requested by some of my students that love these events so much! They wanted one more Quest before school is out- so, of course, I had to invent one. The first task involves a scavenger hunt- another thing kids adore. The resource has an editable template that you will use to design the locations for your scavenger hunt. Large signs are included that are used with the scavenger hunt. Students fill in the scavenger hunt papers to solve the puzzle for the first lock code. This one is super easy to prepare. Students are completing a maze and after completing it they need a clue from you about the lock code. The maze is so much fun! It is a different sort of maze with no way out from the center. Instead, students are tracing paths to collect numbers for the lock code. This last task was so much fun and very different from any task we have completed all year. It's a Secret Message using a Secret Code. Students decipher the message and it gives them the last lock code! Seriously, this last one uses one paper. And that paper has TWO secret messages on it so you cut it in half. 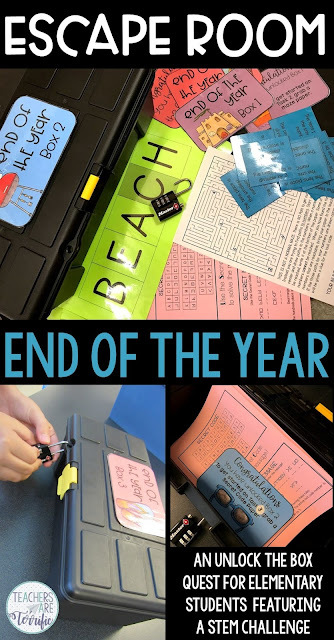 If you want to end this Escape Room with a STEM Challenge, a very simple one is included. It only uses two materials- pipe cleaners and bubble solution. I included my recipe for bubble solution, but you can also purchase a pre-made mix to save even more prep time. Teacher directions for the STEM Challenge are included. You only need to print the criteria cards for the challenge and set up the materials. You could also choose to project the challenge rules and save time not copying those! And, just in case you are not up for a challenge this late in the school year, you can use the summer Color-by-Number sheet that is included! The Bubble Challenge was great fun and easy for kids to tackle. We did a lot of exploration in the classroom before taking the bubbles outside. It was a great way to end the Escape Room experience. Scavenger Hunt signs- there are 4 to a page and you copy these and cut the pages in half. Scavenger Hunt clues for the lock code- one page, copy it and cut the clues apart. Clues for task 2- copy the page and cut it apart. Secret Code and Secret Message paper- copy the page and cut it in half. OPTIONAL: If you are using the STEM Challenge you can copy the criteria cards and the lab sheet. OPTIONAL: Instead of the STEM Challenge you can copy the Color-by-Number sheet. That's really all there is to this one! A few copies, a few pages to cut apart, and you are good to go. Of course, you can add the locked boxes and box labels if you like! Also, if you have the extra time (ha!) you can print all these items on brightly colored paper and laminate. Save it all in a large zippered bag and it will be ready for next year. And before you can blink, May of 2019 will be here! Summer Series about my STEM Journey and What I have Learned! What grades are the Escape room activities best suited for? 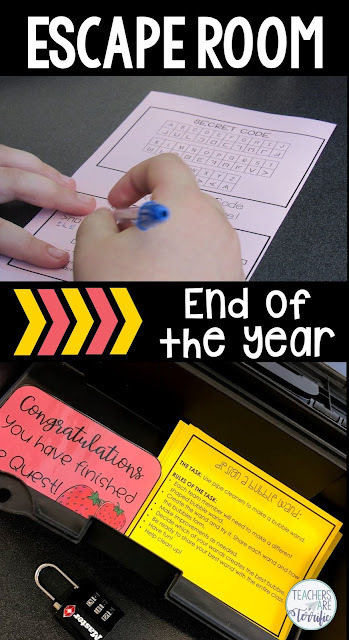 This Escape Room would be great for 3rd to 5th grades!